This article is about a city in Gujarat. For the sub-city in Delhi, see Dwarka (Delhi). For the ancient city in Indian epic literature, see Dvārakā. For the nearby island, see Bet Dwarka. For other uses, see Dwarka (disambiguation). Dwarka ( pronunciation (help·info)) is an ancient city and a municipality of Devbhoomi Dwarka district in the state of Gujarat in northwestern India. It is located on the western shore of the Okhamandal Peninsula on the right bank of the Gomti River. In 2011 it had a population of 38,873. Dwarka is one of the foremost Chardhams, four sacred Hindu pilgrimage sites, and is one of the Sapta Puri, the seven most ancient religious cities in the country. 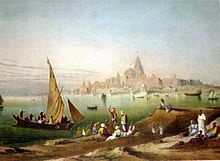 Dwarka is often identified with the Dwarka Kingdom, the ancient kingdom of Krishna, and is believed to have been the first capital of Gujarat. Dwarika Jagat Mandir (or Dwarkadhish Temple), view from entrance of the city. 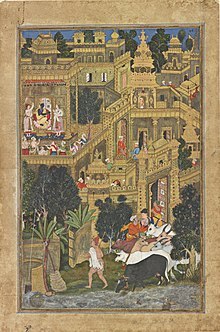 A painting depicting Krishna's Dwarka, made during Akbar's reign, from the Smithsonian Institution. Dwarka is believed to have been the first capital of Gujarat. The city's name literally means the "gateway to heaven" in Sanskrit, as Dwar means "gate" and ka references "Brahma". Dwarka has also been referred to throughout its history as "Mokshapuri", "Dwarkamati", and "Dwarkavati". It is mentioned in the ancient prehistoric epic period of the Mahabharata. According to legend, Krishna settled here after he defeated and killed his uncle Kansa at Mathura. This mythological account of Krishna's migration to Dwarka from Mathura is closely associated with the culture of Gujarat. Krishna is also said to have reclaimed 12 yojanas or 96 square kilometres (37 sq mi) of land from the sea to create Dwarka. Dwarka was established as the capital in Saurashtra by the Aryans during the Puranaic. The Yadavas, who had migrated from Mathura, established their kingdom here when the city was known as "Kaushathali". It was during this period that the city underwent rebuilding and was named Dwarka. A friendly population of natives also prompted Krishna to settle at Dwarka when he decided, after fighting Jarasandha, the king of Magadh, to retreat from Mathura. The kingdom, also known as the Yaduvanshi empire, was established by Uugrasena, father of Kansa the then ruler and later Krishna flourished and extended its domain. It is said that Krishna conducted the administration of his kingdom from Dwarka while residing with his family in Bet Dwarka.. The city's Dwarkadhish Temple dedicated to Krishna was originally built around 2,500 years ago, but was destroyed by Mahmud Begada rulers and subsequently rebuilt in the 16th century. The temple is also the location of Dwaraka maţha, also called Sharada Matha/Peeth and "western peeth",[note 1] one of the four peeths (Sanskrit: "religious center") established by Adi Shankaracharya. As an important pilgrimage centre for Hindus, Dwarka has several notable temples, including Rukmini Devi Temple, Gomti Ghat, and Bet Dwarka. There is also a lighthouse at the land end point of Dwarka. Archaeological investigations at Dwarka, both on shore and offshore in the Arabian Sea, have been performed by the Archaeological Survey of India. The first investigations carried out on land in 1963 revealed many artefacts. Excavations done at two sites on the seaward side of Dwarka brought to light submerged settlements, a large stone-built jetty, and triangular stone anchors with three holes. The settlements are in the form of exterior and interior walls, and fort bastions. From the typological classification of the anchors it is inferred that Dwarka had flourished as a port during the period of the Middle kingdoms of India. Coastal erosion was probably the cause of the destruction of what was an ancient port. Dwarka is mentioned in the copper inscription dated 574 AD of Simhaditya, the Maitraka dynasty minister of Vallabhi. He was the son of Varahdas, the king of Dwarka. The nearby Bet Dwarka island is a religious pilgrimage site and an important archaeological site of the Late Harappan period, with one thermoluminescence date of 1570 BC. In 200 AD, King Vasudev II of Dwarka was defeated by Mahakshatriya Rudradama. Upon the death of Rudradama, his wife, Queen Dheeradevi, invited his brother Pulumavi, seeking guidance to rule. Rudradama had embraced the Vaishnava religion and worshipped Krishna at Dwarka. Vajranabha, his successor, built a chhattri (an umbrella type monument) and deified an idol of Krishna in it. An epigraphic reference ascribed to Garulaka Simhaditya, the son of Varahdas, the king of Dwarka, is inscribed on a copper plate dated to 574 AD, found in Palitana. The Greek writer of the Periplus of the Erythraean Sea referred to a place called Baraca, which has been interpreted as present-day Dwarka. A reference made in Ptolemy's Geography identified Barake as an island in the Gulf of Kanthils, which has also been inferred to mean Dwarka. One of the four dhams (religious seats), which were founded by Adi Shankaracharya (686–717 AD) at the four corners of the country, was established as a monastic centre at a time when mainstream Hinduism had still not been accepted; it forms part of the Dwarka temple complex. In 885 AD, the temple was renovated by Nrushinhaashrma, head of the Shankaracharya pitha (centre). In 1241, Mohammad Shah invaded Dwarka and damaged the temple. During this battle, five Brahmins (Virajee Thakar, Nathu Thakar, Karasan Thakar, Valjee Thakar, and Devasee Thakar) fought against him, died, and were honoured as martyrs. A shrine was built near the temple in their honour and is known as "Panch Peer", which is a name of Muslim origin. In 1473 the Gujarat Sultan Mahmud Begada sacked the city and destroyed the temple of Dwarka. The Jagat Mandir or the Dwarakadhisa temple was later rebuilt. Vallabha Acharya retrieved an idol of Dwarkadhish, which was revered by Rukmini. He hid it in a stepwell, known as Savitri vav, during the Muslim invasion, before moving it to Ladva village. In 1551, when Turk Aziz invaded Dwarka, the idol was shifted to the island of Bet Dwarka. Dwarka is one of 12 heritage cities across the country selected under the Heritage City Development and Augmentation Yojana (HRIDAY) scheme of the Government of India to develop civic infrastructure. The Sudama Setu, a bridge over the Gomti River connecting mainland Dwarka with Panchkui island was opened in 2016. Dwarka, at the mouth of the Gulf of Kutch, on the western shore of the Okhamandal Peninsula, is on the right bank of the Gomti River which rises from the Bhavda village at a place known as Mul-Gomti, 10 kilometres (6.2 mi) to the east. It is now under the newly formed district of Devbhoomi Dwarka at the western end of the Saurashtra (Kathiawar) peninsula, facing the Arabian Sea. The Gomti River was a harbour until the 19th century. Dwarka is well connected to the rest of India by air, rail, and road transport. It is 131 kilometres (81 mi) by State Highway 947 from Jamnagar, where there is a domestic airport. The Dwarka railway station is on the broad gauge railway line that runs from Ahmedabad to Okha at a distance of about 137 kilometres (85 mi) from Jamnagar. Dwarka is 217 kilometres (135 mi) away from Rajkot and 378 kilometres (235 mi) from Ahmedabad. According to the Köppen-Geiger classification, Dwarka has a subtropical desert/low-latitude arid hot climate. The Holdridge life zones system of bio-climatic classification identifies Dwarka in or near the subtropical thorn woodland biome. On the basis of 40 years of climatic data: The average annual rainfall is 310 millimetres (12 in) spread over a rainy period of 29 days with rainfall limited to the months of June to September; the average maximum temperature is 31 °C (88 °F) with a maximum of 42 °C (108 °F) and an average minimum temperature of 15 °C (59 °F) with a minimum of 5 °C (41 °F); the average annual relative humidity is 72%, with a maximum of 80%. As of the 2011 Census of India, Dwarka had a population of 38873(as per Census 2011, the population reported is 38,873). Males constitute 20306 of the population, and females constitute 18567. Dwarka has an average literacy rate of 75.94%, lower than the national average of 78.03%; the male literacy rate is 83%, and the female literacy rate is 68.27%. 11.98% of the population is under six years of age. Most of the revenue of Dwarka is derived from tourism, due to it being a site for pilgrims. It is a producer of agricultural produce such as millets, ghee (clarified butter), oilseeds, and salt, which are transported from its port. A long term development plan was proposed in 2011 with investment of ₹830 million (US$12 million) to refurbish the city of Dwarka and to build a bridge connecting the city with Okha and Bet Dwarka..A wind farm power generation of 39.2 MW, operated near Dwarka by the AES Saurashtra Windfarms Pvt Ltd (ASW), is now run by Tata Power Renewable Energy Ltd (TPREL). Dwarka's industrial activity mainly centres around cement production..Dwarka's economy relies heavily on pilgrims and tourism but is supplemented by the production of millets, ghee (clarified butter), oilseeds, and salt, which are transported from its port. A long-term development plan was proposed in 2011 by the Government of Gujarat, with investment of ₹830 million (US$12 million) to refurbish the city of Dwarka and build a bridge connecting the city with Okha and Bet Dwarka. Janmashtami is the main festival that is celebrated during August and September. Sharda Peeth Vidya Sabha is an educational society sponsored by the Sharda Peeth, Dwarka which runs an arts college in Dwarka. Dwarka was selected as a heritage city by the Indian government's Heritage City Development and Augmentation Yojana (HRIDAY) initiative. Considered a holy city, Dwarka is a well known for its temples and as a pilgrimage centre for Hindus. The Dwarakadhisa Temple, also called Jagat Mandir, located in the heart of Dwarka, is a Vaishnava temple. It was built by Raja Jagat Singh Rathore, hence it is called Jagat Mandir. The temple, facing west, is at an elevation of 12.19 metres (40.0 ft) above mean sea-level. It is conjectured that this temple location is 2,500 years old and is where Krishna built his city and a temple. However, the existing temple is dated to the 16th century). It is a five-storied edifice built over 72 pillars (a sandstone temple with 60 pillars is also mentioned). The temple spire rises to a height of 78 metres (256 ft), and a very large flag with symbols of the sun and moon is hoisted on it. The temple layout consists of a garbhagriha (Nijamandira or Harigraha) and an antarala (an antechamber). The main deity deified in the sanctum is of Dwarkadeesh, which is known as the Trivikrama form of Vishnu and is depicted with four arms. The Dwarakadhisa Temple is also the location of Dvaraka Pitha, also called Sharada Matha/Peeth and "western peeth"),[note 1] one of the four peeths (Sanskrit: "religious center") established by Adi Shankaracharya. Gomti Ghat consists of steps leading to the Gomti River, which is also a holy place for pilgrims to take a dip in the river, before visiting Dwarakadish temple. The ghat has a number of small shrines dedicated to the Samudra (God of the Sea), Saraswati and Lakshmi. Other notable temples in the ghat area include the Samudra Narayana (Sangam Narayana) temple, which is at the confluence of the Gomti River with the sea, the Chakra Narayana temple where there is a stone with an imprint of a chakra as a manifestation of Vishnu, and the Gomati temple, which has an idol of the river goddess Gomati that is said to have been brought to earth by the sage Vasishta. 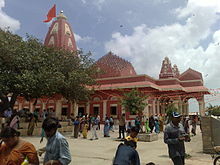 The Rukmini Devi Temple, dedicated to Rukmini, Krishna's chief queen, is located 2 kilometres (1.2 mi) away from Dwarka. The temple is said to be 2,500 years old, but in its present form it is estimated to belong to the 12th century. It is a richly carved temple decorated with sculptures of gods and goddesses on the exterior with the sanctum housing the main image of Rukmini. Carved naratharas (human figures) and carved gajatharas (elephants) are depicted in panels at the base of the tower. There is a lighthouse at the Dwarka Point on the Dwarka peninsula, which provides a panoramic view of the city. It is a fixed light situated 70 feet (21 m) above the sea level, and the light is visible over a distance of 10 miles (16 km). The lighthouse tower is 40 feet (12 m) in height and is 117 yards (107 m) away from the high water level in the sea. The radio beacon provided on this lighthouse tower is powered by a solar photovoltaic module. There is a lake or tank called Gopi Talab in the western part of the city. A similar lake known for Gopi Chandan, meaning "sandal paste from Gopi", is situated in Bet Dwarka; this mud is found in the bed of the lake. This fragrant mud is applied as a sanctity symbol by devout Hindus on their forehead. Bet Dwarka, an island in the Arabian sea off the coast of Dwarka. Considered the original residence of Krishna, Bet Dwarka was the old port during the ancient times of Krishna before the Okha port was developed in Dwarka. The temple built here is credited to the religious Guru Vallabhacharya of the "Pushtimarg Sampradaya". Rice is the traditional offering here to the deity as it is believed that Sudama offered rice to his childhood friend Krishna. There are also smaller shrines on Bet Dwarka which are dedicated to Shiva, Vishnu, Hanuman and Devi. According to a legend, Vishnu killed the demon Shankhasura on this island. There are temples of Vishnu in the incarnation of matsya, or fish. Other shrines here are of Rukmini, Trivikrama, Devaki, Radha, Lakshmi, Satyabhama, Jambavati, Lakshmi Narayan, and many other gods. Hanuman Dandi temple is another notable temple located in Bet Dwarka, 6 kilometres (3.7 mi) away from Dhwarkadhish Temple, Bet Dwarka. The temple is deified with many images of Hanuman and his son Makardhwaja. The legend associated with the birth of a son to Hanuman, who is considered celibate, is that the sweat of Hanuman was consumed by a crocodile which then gave birth to a son named Makardhwaja. The Jethwa Rajput clan of Kshatriyas claim their descent from Makardhwaja. Nageshvara Jyotirlinga Mandir is a temple dedicated to Shiva, and one of the twelve Jyotirlingas (meaning radiant sign of The Almighty) is deified here in a subterranean cell. Janmashtami is the main festival that is celebrated during August and September with great fervor and piety as it was in the prehistoric times the abode of Krishna. The festival is marked by several night long celebrations to mark the birth of Krishna. Bhajans and sermons are part of the festivities. At midnight there is reenactment of Krishna's childhood in the form of Garba and Raas dances. On this occasion, the local boys create a pyramid and a young boy in the costume of Krishna climbs up this pyramid to strike a pot holding butter, an act which Krishna had mischievously performed with the gopis. Sharda Peeth Vidya Sabha is an educational society sponsored by the Sharda Peeth, which runs an arts college in Dwarka. The city is also home to the N.D.H. High School and P.V.M Girls' High School. The underwater ancient city off the coast of Bet Dwarka has been proposed to be developed as a scuba diving site. This project is a joint initiative of Adventure Sports Ltd (ASL) and the Government of Gujarat, with investment of ₹13 crore (US$1.8 million). This is believed to be the first effort anywhere in the world to exploit a submerged city for tourism. Water and beach sports are also being promoted by the state government, and there are proposals to further promote aero and submarine sports. ^ a b Dvaraka Peeth, located in the west, and Sringeri Sharada Peetham, located in the south, are both called "Sharada Peeth". In the Telugu language, "Sharada" (శారద) is the name for Saraswati, the Hindu goddess of knowledge, music, arts, wisdom and learning. The Sharada Matha/Peeth is not to be confused with Sharada Peeth, a temple in Kashmir. ^ a b c d e f g h Desai 2007, p. 285. ^ a b Sridharan 2000, p. 7. ^ a b "Dwarka Nagari -Introduction & Importance". Dwarkadish organization. Archived from the original on 23 June 2012. Retrieved 27 November 2013. ^ Journal of the Bombay Branch of the Royal Asiatic Society. The Branch. 1910. ^ Yagnik & Sheth 2005, p. 3. ^ a b c d "Special Section: Underwater Cultural Heritage: An ancient harbour at Dwarka: Study based on the recent underwater explorations" (pdf). Current Science Journal. Retrieved 14 April 2015. ^ Apte 2012, p. 25, 37. ^ Yadava 2006, p. 160. ^ a b Pilgrim Places of India. Ocean Books. p. 36. ISBN 978-81-87100-41-6. ^ a b nn 1964, p. 12. ^ Subramanian, T.S. (23 February 2007). "Significant finds at Dwaraka". The Hindu. Retrieved 14 April 2015. ^ Gaur, A.S.; Sundaresh and Sila Tripati (2004). "An ancient harbour at Dwarka: Study based on the recent underwater explorations". Current Science. 86 (9). ^ Singh 2008, p. 222. ^ Ansari, Z. d (1964). Excavations At Dwarka: 1963. ^ a b c d e f "The Brief History of Trelokya Jagad Mandir". Dwarkadish.org. Retrieved 17 September 2015. ^ Brockman 2011, p. 94. ^ Sen 2013, p. 115. ^ Yagnik & Sheth 2005, p. 50. ^ a b c d e "Dwarka". Encyclopedia Britannica. Retrieved 19 April 2015. ^ Dharaiya 1970, p. 120. ^ "Gujarat During The Great Revolt: The Rebellion In Okhmandal". People's Democracy. 7 October 2007. Retrieved 19 April 2015. ^ Yagnik & Sheth 2005, pp. 94–95. ^ Sheikh, Samira (1 May 2017). "Ruling Dvārakā: Kṛṣṇa's Capital in Later Times (ca. 1450–1950)". The Journal of Hindu Studies. 10 (1): 112–130. doi:10.1093/jhs/hix004. ISSN 1756-4255. ^ "Government to develop 12 heritage cities; blueprint by 2017". Daily News and Analysis. 22 April 2015. Retrieved 30 April 2015. ^ "Sudama setu' connecting Dwarka with Panchnad likely to be completed before Janmashtami festival". The Indian Express. 20 June 2015. Retrieved 12 September 2015. ^ Gaur, A.S.; Tripati, Sila. "Ancient Dwarka: Study Based On Recent Underwater Archaeological Investigation" (pdf). National Institute of Oceanography. pp. 56–58. Retrieved 11 April 2015. ^ "Dwarka Climate & Temperature". Dwarka.climatemps.com. Retrieved 9 April 2015. ^ a b "Dwarka Climate Record". Weatherbase.com. Retrieved 9 April 2015. ^ a b "Census of India 2001: Data from the 2001 Census, including cities, villages and towns (Provisional)". Census Commission of India. Archived from the original on 16 June 2004. Retrieved 1 November 2008. ^ "Dwarka Population Census 2011". Census2011.com. Retrieved 1 November 2008. ^ "Gujarat draws 34 proposals to boost tourism". Rediff.com. 7 March 2011. Retrieved 19 April 2015. ^ "Tata Power acquires 39.2 MW wind farm in Gujarat". The Hindu Business Line. 25 February 2014. Retrieved 19 April 2015. ^ Bandyopadhyay 2014, p. 71. ^ a b c d Bansal 2008, pp. 20–23. ^ Paramāra 1996, p. 87. ^ Singh & Mishra 2010, p. 322. ^ "Jamnagar". Government of Gujarat Tourism. Retrieved 14 April 2015. ^ a b Kapoor 2002, p. 2103. ^ Findlay 1876, p. 825. ^ Sah 1995, p. 27. ^ a b Desai 2007, p. 286. ^ Deshpande 2005, p. 273. ^ Desai 2007, p. 71. ^ District Census Handbook. Director, Government Print. and Stationery, Gujarat State. 1964. pp. 43, 183. ^ Prabhune, Tushar (18 February 2005). "Dwarka under sea! Now you can see". The Economic Times. Retrieved 12 September 2015. ^ "Adventure and Sports Tourism". Official Gujarat Portal. Retrieved 12 September 2015. Apte, Prakash Madhusudan (2012). The Building of Gandhinagar: New Capital of Gujarat, India. Prakash M Apte. ISBN 978-93-81205-53-2. Bandyopadhyay, Deepak (11 June 2014). Hinduism. Rupa Publications India Pvt. Ltd 2014. ISBN 978-81-291-3428-8. Bansal, Sunita Pant (1 January 2008). Hindu Pilgrimage. Pustak Mahal. ISBN 978-81-223-0997-3. Brockman, Norbert (13 September 2011). Encyclopedia of Sacred Places. ABC-CLIO. ISBN 978-1-59884-655-3. Desai, Anjali H. (2007). India Guide Gujarat. India Guide Publications. ISBN 978-0-9789517-0-2. Deshpande, Aruna (2005). India: A Divine destination. Crest Publishing House. ISBN 81-242-0556-6. Dharaiya, Ramanlal Kakalbhai (1970). Gujarat in 1857. Gujarat University. Findlay, Alexander George (1876). A Directory for the Navigation of the Indian Ocean: With Descriptions of Its Coasts, Islands, Etc., from the Cape of Good Hope to the Strait of Sunda and Western Australia : Including Also the Persian Gulf, the Winds, Monsoons, and Currents, and the Passages from Europe to Its Various Ports. Richard Holmes Laurie. Kapoor, Subodh (2002). The Indian Encyclopaedia. Cosmo Publications. ISBN 978-81-7755-257-7. Paramāra, Thomasa (1996). Temples of Gujarat Built During the Mughal Period. Thomas B. Parmar. Sah, S. L. (1 January 1995). Renewable and Novel Energy Sources. M.D. Publications Pvt. Ltd. ISBN 978-81-85880-82-2. Sen, Sailendra (2013). A Textbook of Medieval Indian History. Primus Books. p. 115. ISBN 978-93-80607-34-4. Singh, Upinder (2008). A History of Ancient and Early Medieval India: From the Stone Age to the 12th Century. Pearson Education India. ISBN 978-81-317-1677-9. Sridharan, K. (1 January 2000). Sea: Our Saviour. Taylor & Francis. ISBN 978-81-224-1245-1. Yadava, S. D. S. (1 January 2006). Followers of Krishna: Yadavas of India. Lancer Publishers. ISBN 978-81-7062-216-1. Yagnik, Achyut; Sheth, Suchitra (1 January 2005). The Shaping of Modern Gujarat: Plurality, Hindutva, and Beyond. Penguin Books India. ISBN 978-0-14-400038-8. Wikimedia Commons has media related to Dwarka.